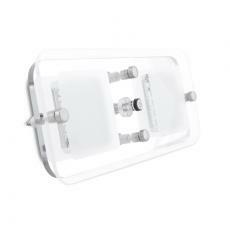 This LED Crystal Ceiling Light is widely used in RV, caravan, camper trailer, etc. There are four different brightness levels of this light, blue, general cool white, strong cool white, strongest cool white lighting. This light can work stably and create soft and even output without glare with its elegant frosted lens, making your trip cozy and comfortable. It is a combination of practicality and decoration. You will have no trouble installing the light with the provided screws. For your convenience, it is designed to be energy-saving, highly efficient and maintenance free with a long service life. Attention: CLEAN ONLY WITH WATER AND SOFT CLOTH. USE OF SOLVENT, METHYLATED SPIRITS AND ABRASVIES CAN RESULT IN DAMAGE TO THE LAMP LENS. All screws are hidden after installation to leave a clean finish.